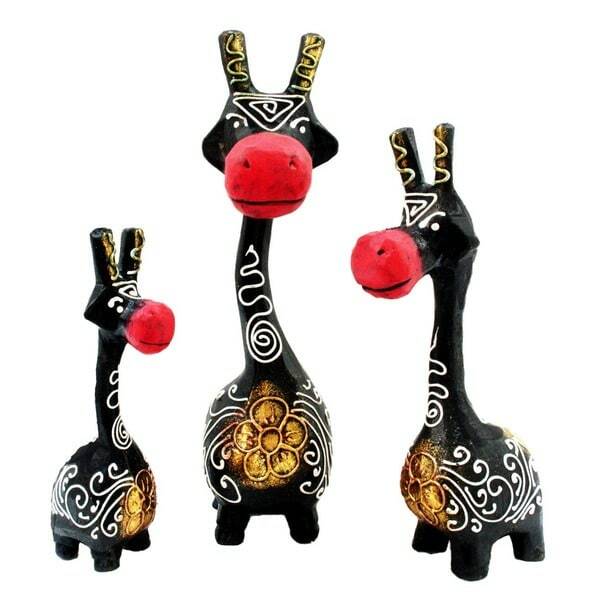 Add a little touch of the African wilderness in your home decor with these wooden giraffe statues. The bold color combination of these miniature giraffes is sure to catch the attention of guests.This set is handcrafted by the artisans of Bali, Indonesia. From the many islands of Indonesia rich in culture and tradition, these decorative pieces are hand made by the Islanders using sustainable materials. Modern Indonesian painters use a wide variety of styles and themes. This whimsical trio is simply adorable. The giraffes are nicely made with visual depth, which adds to their appeal. They are in graduated sizes, indicating a family - mother, father, and child, but they are so sweet, I am sure you can describe them however you please. 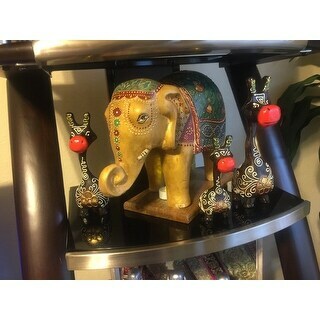 They are perfect for the person who loves "chatchkas" (decorative objects), and will definitely bring smiles to everyone's faces when they see them sitting atop a table, credenza, or wall unit. On a more serious note, I must add that the middle size giraffe did not sit properly, as the front legs were shorter than the rear ones. I simply put a circular felt pad under the front legs and she is perfect! The giraffes are three lovely works of art. I like the detail and the colors. They are lightweight and came packaged very nicely. They really add a nice dimension to my collection. I am very happy with the quality and the purchase. These 3 giraffes represent my three children. The fact that they are carved in indonesian was a plus for me. They are 3 different sizes and there colors are really nice. Good job on the cravings. They were just as expected. Cute and a little on the whimsical side. They were just the right size for my space and the colors are perfect. A terrific find. beautiful and cute statues , nice handcraft and looks very traditional . This works for accent table. black , golden shade make it very attractive and same very decent. These giraffes are SO cute. They are light weight and great to add a little character to decor. I liked these at the first glance. Thy looked just as in picture. I loved these when I opened them, very cute. Sadly the two smaller ones must have been top heavy and didn't stand well on their own. I thought I had the smallest one stable, but the second day I had them it fell over and the head broke off. Disappointed. I love these guys, they add a whimsy to my room as they face a letter sent to me for my birthday signed by President Clinton. It looks as if they are reading it.. Gotta love it! Cutest giraffe collection! These are so amazing. The bright red noses and gold give them such character. Great for all my little collections! So cute for my end table! !